When you train a lot, it is highly important to stay hydrated, focused and above all, properly fed. Since protein is responsible for muscle growing and recuperation, you need to make sure that your diet contains the necessary amount of nutrients, vitamins and minerals. There is no better and more convenient way to add a supplementary source of protein to your diet than to use PROTEIN BARS after workouts. Studies show that protein bars contain lower percentage of carbohydrates and thus have fewer calories. While it is important to receive nutrients immediately after a training session, additional meals should not exceed your daily calorie limit. BioNutritional Power Crunch Protein Energy Bar High protein cream wafer sticks, each containing 14 grams of protein, eating protein bars friend, as long as this protein eaten waffles, will know what is really delicious and nutritious, rich outer..
BSN Syntha-6 Protein Crisp Unique Crisp Texture. Decadent Syntha-6 Taste Light, rice crispy-like texture, 20g of Premium Proteins,Only 4g Sugar,240 Calories per bar.. 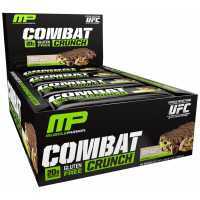 Muscle Pharm Combat Crunch Bars It is so simple to get the amount of protein you need and carry it everywhere with the new Combat Crunch Bars from Muscle Pharm brand. They are not only easy to take anywhere but they are also very healthy a..
Oh Yeah Nutrition Oh Yeah! ONE Bar22g Protein, Whey Protein Isolate, Milk Protein IsolateOnly 1g Sugar2-3 net CarbsHigh in Fiber – Non GMO Certified Gluten Free ..
Quest Nutrition have created a completely new formula for ordinary brownies, earning a patent from some of the industry's most respected laboratories. Quest Bar 12 Bars 2.12 Oz 60 Grams is filled with protein from natural product. It doesn't contain ..
QUEST最求完美終於做出了健康的蛋白薯片.完全顛覆傳統薯片的概念. 每包含:高蛋白（21克）,低碳水（5克）,低脂肪（2克）,低卡路里（120卡）,絕非油炸（烘烤更健康）,加上天然調味 成分:蛋白質（乳清分離蛋白）,乾燥玉米澱粉,土豆,葵花籽油,天然口味,包含小於2 %以下成分:脫脂幹牛奶,鹽,蘋果酸,碳酸鈣 Chips aren't what they used to be, Quest PROTEIN CHIPS have completely cha..